Beijing University of Physical Education was founded on November 1,1953 .First by the name of the Central Institute of Physical Education. It was renamed Beijing Institute of Physical Education in 1956, and became a university and assumed its present name in 1993.It is the only physical education university and one of the major institutions of higher learning in China. It recruits students from all over China and world. The main task of the University is to train highly-qualified physical education teachers, sports coaches, sports science researchers, physical education administrative personnel, social physical education instructors and other professional physical education personnel. At present, it has an enrollment of about 3000 students.Located in Haidian, a picturesque suburb in northwest of Beijing, close to the Yuan Ming Yuan Site Park, the University campus is full of scenic beauty, with trees and greenery neatly trimmed. 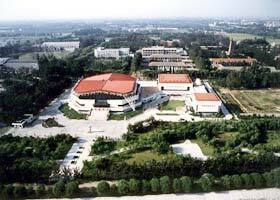 The campus covers an area of 70 hectares (1000mu), with a building area of 170,000 square meters. The University offers comparatively complete specialties and subjects of studies in physical education and sports. At present it has a Graduate Department, a Physical Education and Sports Administration College, a Physical Education Department, a sports Training Department, a Wushu Department, a Sports Bio-Sciences Department, and an Adult Education Department. Attached to the University is a sports School. The faculty of the University is of comparatively high academic level. There are 200 professors and associate professors and 176 lecturers working in the 24 teaching and research sections. Among whom 28 are International Judges and 150 are Nation Judges of different sports. The University has been authorized to award the Doctor's Degree on 3 specialties and 8 research orientations and to award the Master's Degree on 8 subjects of studies. Fifteen of the professors are authorized tutors for doctorates. The University provides complete facilities for teaching, sports training and scientific researches. It has a Scientific Centre, an Audio-Visual Education Centre, and a Library and Sports Information Centre. There are 15 indoor training halls for track and field, swimming, ball games, badminton, table tennis, wushu, gymnastics and rhythmic gymnastics and 68 outdoor courts and fields, among which is the university sports complex. With unique design and a seating capacity of over 3000, the complex was once the site for boxing competitions at the 11th Asian Games, and is now used for basketball, volleyball, tennis and rhythmic gymnastics training and competition. Since its foundation, the University has always attached importance to the integration of teaching, scientific research and sports training, and adhered to the principle of being strict and seeking-truth-through-facts in academic pursuance. As a result, it has trained a great number of high-level physical education and sports personnel who excel in moral as well as academic performances. Since 1980, the University has turn out 208 Masters of Sports and 21 International Masters of Sports. Sportsmen and sportswomen from the University have won titles 263 person-times at national sports competitions, 17person-times at world sports events, and 14 person-times at Asian sports meets. Nine times did they break the Asian sports records. Altogether the University has turned out more than 20,000 graduates, among whom 833 obtained either Doctor's or Master's Degrees. They spread all over the country, and many have become mainstay in circles of physical education and sports. The University has efforts to develop academic exchanges with institutions of higher learning in foreign countries. Attention has also been paid to assimilating and drawing on their experience in administration of physical education colleges. Up to the present, the University has successively established intercollegiate relations with 18 universities or colleges in Japan, the Republic of Korea, the United States, Canada, Australia, Germany, Russia, Bulgaria and Poland, and had friendly ties with the Sports Association of the city Shizoka in Japan. The IAAF has chosen to establish its Regional Development Centre for East Asia in the campus of this University. Exchanges with foreign countries have been frequent. More than 2,000 guests from all over the world came annually to the University for academic exchanges or advanced studies. The University reciprocated by sending a number of its scholars to visit these countries. Up to now, the University has admitted a total of over 200 international students in its undergraduate program and over 8000 students in its short-term training program, who were from more than 40 countries. There are about 150 international students at the University now. The campus of our University is quiet, clean and beautiful. There are 2 dormitory buildings for foreign students to live. There are altogether 145 ordinary rooms and 9 standard rooms. There is a TV set, an electric fan, a desk and bedding in each room. There is a public telephone, a shower room and a kitchen in each floor. There is a restaurant, a store and international telephone booths in the buildings to cater for the study and living of every kind of student. At present the University is making every effort to meet the requirement of the socialist market economy for qualified personnel of physical education and sports. It is carrying out bold reforms and seeking new ways of education, and marching toward its goals: to build itself into a first-rate university of physical education in China and one of the best of its kind on the international scene.